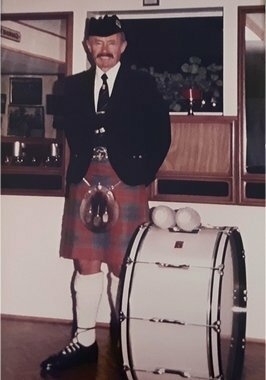 George McKillop, former bass drummer of the SFU Pipe Band, passed away in late February 2019 at age 87. George began his pipe band career as a snare drummer in the Seaforth Highlanders of Canada Pipes & Drums. He joined the SFU Pipe Band as bass drummer in 1978 continuing until 1987 during which time the band twice placed 2nd in the Grade 1 World Pipe Band Championships. He served again as bass drummer from 1990 until 1994. George had the unique opportunity to win the 1982 Grade 1 North American Championship with his son Dan also playing in the SFU Pipe Band drum corp.
"To hear (and see) “Boom Boom” in the band circle was an event as his actions most definitely spoke louder than his words. George always felt the music. I recall asking him to try bass - not so much having heard he had played some snare - but rather seeing his moves jiving on the dance floor! A character for sure.” remembers former pipe major Terry Lee. Per his wishes, no service was to be held and at the request of his wife Grace, she asks that everyone who knew George to remember him in their own way and to lift a glass in his memory.